It's always a great time to make new business contacts, here's a way to do it quickly and while having fun! 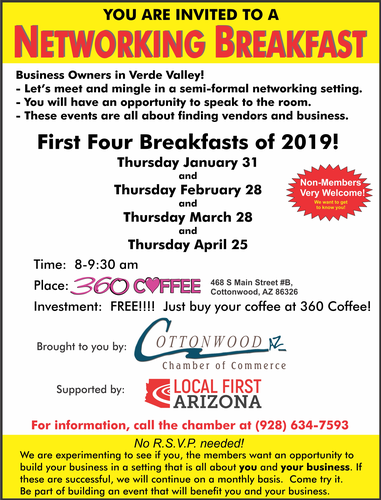 The Cottonwood Chamber and Local First Arizona have put together a monthly gathering of local business owners in a semi-formal setting for a networking breakfast. Come meet new vendors and create relationships that will blossom into business. There is no charge, just buy a cup of great coffee and network with other business owners! Come try it! Be part of an event that will benefit you and your business. Free - No RSVP needed.